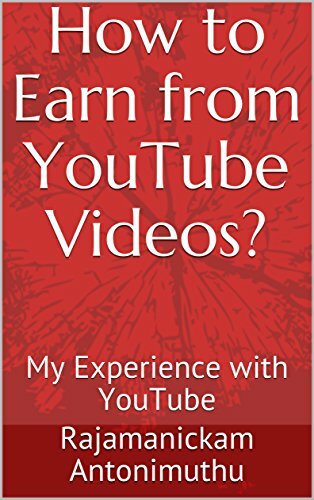 I have published an Amazon Kindle Book with Title "How to Earn from YouTube Videos? : My Experience with YouTube" for sharing my knowledge and experience that I gathered in the past 8 years by running my YouTube Channel "QualityPointTech". If you are interested to read this eBook, you can buy it from Amazon. Note that this book is NOT for telling any secret ways for earning money from YouTube, and it is NOT going to give any tutorial about YouTube. It is just for sharing my understanding and experience with YouTube. So, if you are expecting to get some tutorials and tips for helping you to earn huge money from YouTube easily and quickly, then this eBook will NOT be suitable for you. I have enrolled this eBook to Amazon Unlimited and Kindle Select programs. I would like to get review comments for this eBook. Amazon's Kindle Select program will allow me to make this eBook available FREE for few days. I am planning to use that option for getting review comments. So, I have created a free promotion offer which will allow everyone to get this eBook for FREE on April 16th and 17th. Once after getting this eBook, remember to add your Reviews and Ratings in Amazon website. And, if you are reading this blog post once after Free Offer ends, and still interested in reviewing this eBook, let me know by sending an email to me (rajamanickam.a@gmail.com). I will inform all the interested people by sending an email once after I decide the dates on which this eBook will be available for FREE in future. And, note that my other eBook is available for FREE Today and Tomorrow. (i-e on 15th and 16th April) So, if you are interested to get that Book for FREE, you can do it from here Add your Review and Ratings at Amazon for this Book once after you get it freely. Share this Free Offer with your friends who may be interested to get it.